Description: In September 1864, a Confederate army under Maj.
Gen. Sterling Price crossed into Missouri with the goal of capturing St. Louis. Union Brig. 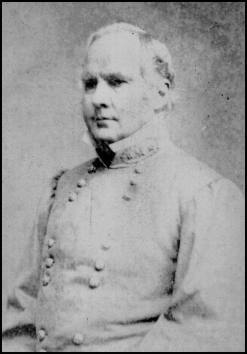 Gen. Thomas Ewing moved with reinforcements down the railroad to Ironton to retard Price’s advance. On the morning of September 27, the Confederates attacked, driving the Federals back into their defenses anchored by Fort Davidson. In the late afternoon, Price unsuccessfully assaulted the fort repeatedly, suffering heavy casualties. Price, considering the possible time involved, had dismissed the possibility of mounting guns on the high ground to compel the fort to surrender or to shell the garrison into submission. During the night, the Federals evacuated the fort. Price had paid a high price in lives and gave Union forces the necessary time to concentrate and oppose his raid. The Battle of Fort Davidson, also known as the Battle of Pilot Knob, was the opening engagement of Price's Missouri Raid during the American Civil War. This engagement occurred on September 27, 1864, just outside of Pilot Knob in Iron County, Missouri. Although outnumbered by more than ten-to-one, the Union defenders managed to repulse repeated Confederate assaults on their works, and were able to slip away during the night by exploiting a gap in the Southern siege lines. The attacking Rebels took possession of the fort the next day, but Price's useless waste of men and ammunition ended his goal of seizing St. Louis for the Confederacy. In September of 1864, the Confederate Army of Missouri under Major General Sterling Price crossed from Arkansas into Missouri, with the initial goal of capturing St. Louis. Moving north to Ironton, near the terminus of the Iron Mountain Railroad from St. Louis, they came upon a Federal outpost at nearby Pilot Knob known as Fort Davidson. Fort Davidson, with its garrison of 1,500 men and seven guns, made a tempting target for Price. Price had a total of 12,000 men under his command, but 3,000 of his men were unarmed; capturing the fort and its cache of arms would certainly prove beneficial. As Price prepared to seize it, he received word that Union troops were moving south to intercept him. Ordering detachments to destroy the railroad to the north at once, he invested the fort with his three divisions on the evening of September 26. 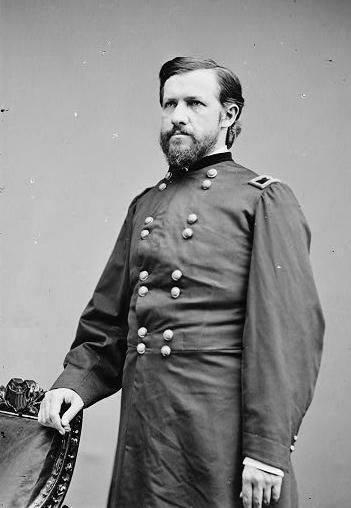 Union Brigadier General Thomas Ewing, commander of the District of St. Louis and brother-in-law to William T. Sherman, had arrived at Fort Davidson on an inspection trip when he learned that the railroad behind him had been cut. Despite being outnumbered ten-to-one, he decided to stand and fight. The fort provided a strong defensive position, with hexagonal walls nine feet high and ten feet thick, surrounded by a dry moat nine feet deep. Two long rifle pits ran out from the walls, while a reinforced board fence topped the earthworks. Access to the fort could only be had through a drawbridge on the structure's southeastern corner. A 300-yard (270 m) cleared field of fire extended in every direction beyond the walls; any enemy approach would prove extremely hazardous. The Battle of Fort Davidson began on September 26, when the leading elements of Price's army encountered Union pickets south of Ironton, 3 miles (4.8 km) south of Fort Davidson. The Federal troops were driven back into the town, and the two sides exchanged fire on the Iron County Courthouse lawn. That building still stands, and damage from stray bullets can still be seen in the structure's bricks. As more Rebels arrived, the dimunitive Union forces withdrew to the fort. On September 27, the attack on Fort Davidson itself commenced. Price and his officers decided to take the post in one massive assault. Price sent men to attack the fort from several directions: one brigade went over the top of Pilot Knob, engulfing a small Union force there, while another attacked over the summit of Shepherd's Mountain. A third brigade skirted Shepherd's Mountain to attack the northwestern sides of the fort, and the forth attacked through a valley between the two mountains. As Union troops were driven back by superior numbers, the Rebels took control of Shepherd's Mountain, southwest of the fort. A two-gun Confederate battery was subsequently deployed there, and its murderous fire caused the smaller of the two rifle pits within the fort to be abandoned. Unfortunately for Price, these assaults were not made simultaneously, allowing the guns of Fort Davidson to be directed at each Confederate unit in turn. Just one brigade actually reached the fort itself, under a withering hail of cannon and musket fire, only to find the earthworks too steep to climb. During the assault, Union defenders were supplied with hand grenades from the fort's magazines; these wood-finned impact devices were tossed over the walls, forcing the Rebels to break off their attack. The disorganized Southerners fell back and prepared to assault the fort again the following day. As Price now set his troops to building scaling ladders for a new assault the next morning, Ewing held a Council of War inside the fort. Ewing had received belated orders from St. Louis to abandon the post; he now agreed that his position was untenable and planned to escape. Union soldiers draped the drawbridge in canvas to muffle the sounds of their movement, and stealthily began to exit the fort. As the survivors withdrew undetected to the northwest (directly between two Rebel encampments), they left a slow-burning fuse to their powder magazine, which exploded in a mighty blast well after the Union troops were gone. Despite the huge explosion, Price did not have his men investigate the condition of the fort until daybreak. Price's subordinates were furious at this deception, and demanded that their commander pursue the escaping Union troops. But Price demurred. He had lost over ten percent of his army and three precious days in this fruitless exercise, and his dreams of taking St. Louis were now clearly dashed. Price's troopers mounted up and resumed their advance northward, eventually turning west toward Jefferson City, the state capital. Finding that city too heavily fortified, they continued even further westward, fighting their way toward Kansas City and Fort Leavenworth. Ultimately, at Westport, Price would suffer a crushing defeat, and was forced to end his Missouri campaign. Although the exact number of Confederate casualties are unknown, historians estimate that total Southern losses at the Battle of Ft. Davidson were approximately 1,000. This compares to 200 Union casualties, 28 of which were killed.